In an increasingly competitive marketplace, modern businesses like Uber, Apple and Amazon have been gathering customer feedback at every touchpoint in an effort to improve the customer experience. With this invaluable information, they are able to continuously improve their products and businesses, giving themselves a competitive edge. But why don't companies apply an equally intense focus on their biggest investment – their employees? Why don’t companies constantly and actively seek feedback with a goal of improving the employee experience? When it comes to efforts towards improving life on the job, there’s a huge disparity compared to the attention given to customers. This disparity is a major reason today’s workforce – Millennials, primarily – are shifting so often from workplace to workplace. Younger employees simply are not working with a company as long as previous generations. According to LinkedIn, in the 20-year period from 1990 to 2010, the number of companies people worked for in the five years after graduation has nearly doubled. A recent survey conducted by Harris Poll shows that by the age of 35, 25% of workers have held five jobs or more. To make matters worse, the costs associated with talent acquisition continue to rise. Once purely an HR function, talent acquisition now involves multiple teams across the organization, costing more in hours and dollars. In addition, new technologies offer an ever-growing array of new HR tools and solutions, including specialized software, social media and video. It follows, then, that employee retention is more important than ever, and providing a better overall experience for our employees is a primary factor. Nearly 80% of executives surveyed in Deloitte’s 2017 Global Human Capital Trends report rated employee experience as very important or important, but only 22% said their companies were excellent at building a differentiated experience. And yet, only 22% of today’s companies take the time to survey employees quarterly or more often, 79% survey employees annually or less often, and 14% never survey employees at all. So, how to go about improving the employee experience – and what does that really mean? While respondents said some of these areas have gotten better in the last year, others are flat or have gotten worse. To accomplish this, companies need to do more than collect annual or quarterly surveys; they need a new approach. They must put systems in place to collect ongoing feedback at various touch points, including crowdsourced ideas and suggestions. Only then will HR and company leadership have a true understanding of each employee’s experience. Engagement surveys are still vital and must be offered at various stages of the employee lifecycle. It’s also important to send out frequent, short polls to get a quick pulse on employee satisfaction and gain brief feedback about various tasks, initiatives and/or deliverables. Engagement surveys and pulse polls are a great way for leadership to obtain feedback on any subject or issue they deem important, but employees must also have the ability to provide feedback outside of leadership’s questions. Employees need a platform to voice their opinions from the bottom-up, in an open environment and without the fear of judgement. They must be able to voice their ideas and opinions freely. And this is where modern platforms like Hyphen can help organizations retain their best talent. 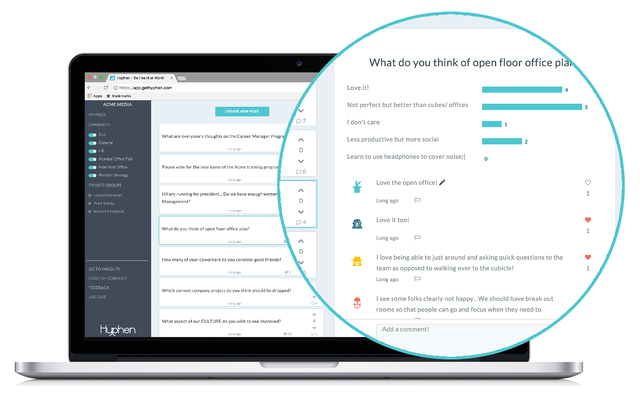 Platforms such as Hyphen have developed capabilities such as bottom-up, crowd-sourced ideas and feedback suggestions to help employees speak up and HR and leadership easily identify the most pressing concerns. By asking the right questions of their employees, and listening to answers and crowdsourced ideas, companies are easily able to improve tackle feedback, ideas, and issues sooner rather than later, improving overall employee experience and keep employees longer – Millennials or not.